Earn up to 1,240 reward points. 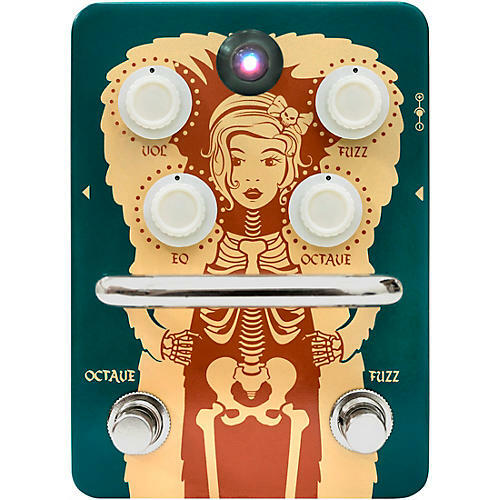 Get thick Orange fuzz and octave play in a true-bypass pedal. The Orange Fur Coat Fuzz is loosely based on the old Foxx Tone Machine which was a great fuzz from 1970. A version of this was later made by Prescription Electronics under the name Experience, which added a swell feature to the existing design. These are also sought after and sell for lots of money secondhand. On the Fur Coat, Orange made the Octave-up adjustable so that it can be turned down from being flat-out. This took a bit of redesigning and in doing so Orange also managed to remove the DC offset from the Octave stomp switch, resulting in the octave being instantly engaged or disengaged. Also, with this modified circuit, the Octave can be dialed in and out using the guitar volume between 8 and 10 as long as the Octave on the Fur Coat Fuzz is less than flat-out. This is the company's only True Bypass pedal. The reason for this is that Fuzz is always better without a buffer placed in front of it as a passive pickup on the guitar is part of the circuit. This is always best used at the front of the chain, directly connected to the guitar with any subsequent pedals following it. If used with a buffer in front of it, the Fuzz will be more like distortion and the octave will be much more pronounced. Vintage Fuzz The Orange Fur Coat fuzz can be used into a clean amp or an amp with some hair. When used into an overdriven amp, it creates a unique, thick “fur coat” of vintage fuzz. Something quite rare, rather than simply being able to switch it on/off, the Fur Coat adds octave up as you increase the octave control. The Orange Fur Coat fuzz draws very little current (much less than 10mA) allowing for long battery life. Use a regulated 9-12V DC centre-negative power supply.